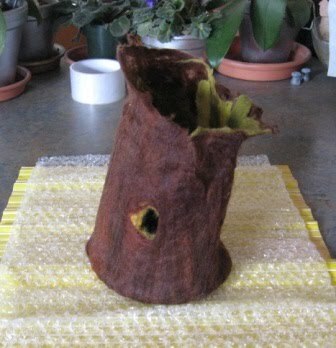 This is a Tree Trunk Vessel I have made out of felting wool. I have made it to donate to the Edmonton and District Quilter Guild. Every year at this time they take in donations for the Endowment fund. The Quilter`s guild started and U of A endowment fund and each year, give a scholarship to a student in the textile department at the U of A. This year we were asked to make a vessel. Other years have been Soft sculpture, Journal covers, and Bags. At our year end dinner they will sell tickets and draw for winners of the Vessels. You buy tickets and place them in the vessel you hope to win. You can place all your tickets in one vessel if that is the one you really want to win. Some people buy enough tickets to place one ticket in each vessel. Here is how I made my vessel. Choose the wool to use. I used 2 oz of merino wool. about half was the darker brown. This is a cardboard tube wrapped in a plastic bag and then wrapped with bubble wrap. This is the form I used to build the wool on. I started to add wool on to the form. I wet the wool a bit as I went a long. This is the inside layer. 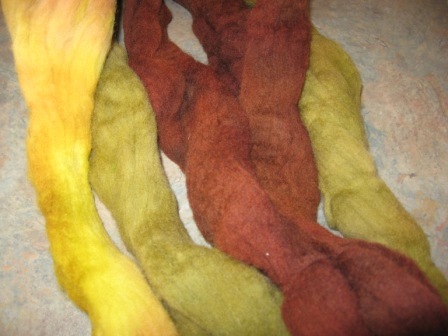 Here is more wool on the form. I think one more layer of brown went on before I started to felt. 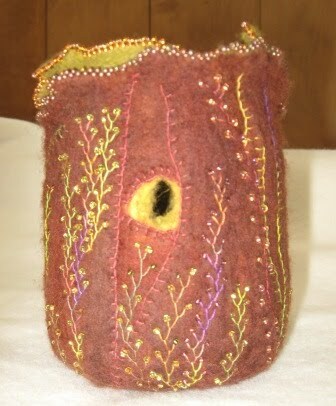 I did some felting and then wanted a whole on the side of my tree trunk. I just used my finger to push the wool around till I had a whole. This whole is the birds entrance to his home in the tree trunk. I moved my hand around the wet warm wool. 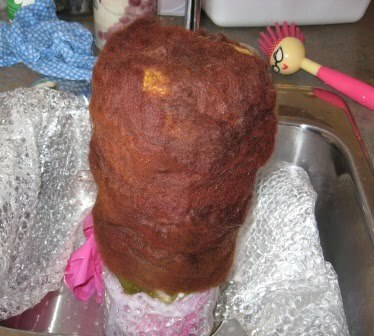 I used soap to help with felting. When the wool is started to felt and becoming one unit, It is time to take it off the form. 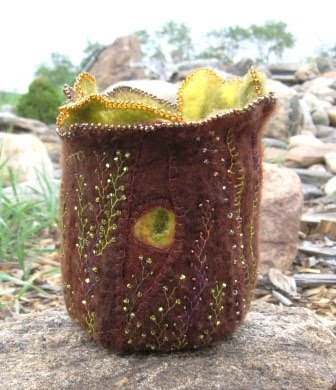 More felting is needed with more pressure. While the wool is still wet, warm and soapy, it will get rolled and more felting. 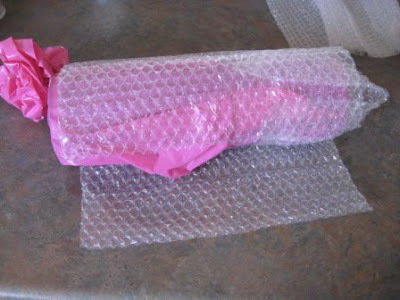 I used a place mat (bamboo) and bubble wrap . I placed a piece of plastic inside the tree truck ( so the middle will not stick together). 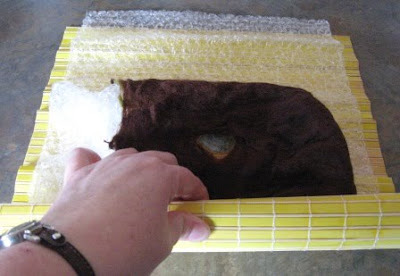 I flattened the wool and started to roll it into a jelly roll. I rolled like I was working a rolling pin over the counter. I applied pressure. Rolled more. Then unrolled and changed the direction of the wool in the roll. I rolled more. 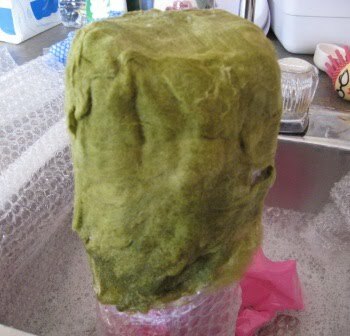 When I thought the wool was well felted I started to rinse out the soap. 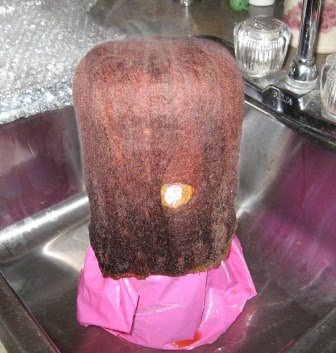 I also poured boiling hot water on the tree trunk (while on the form). I pinched the bottom edge so that the tree trunk to give the tree trunk a real bottom and not just a rounded bottom. I left the wool on the form to dry. 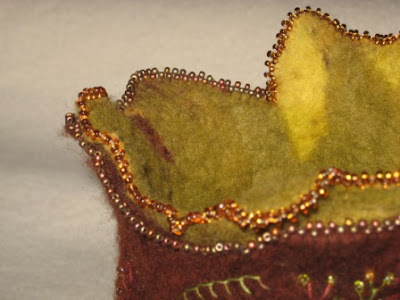 Once it was dry I spend a couple of days adding the thread and beads. Here is the edge beaded. I love the feel and weight of the beads on this edge. This is the back side of the tree truck. 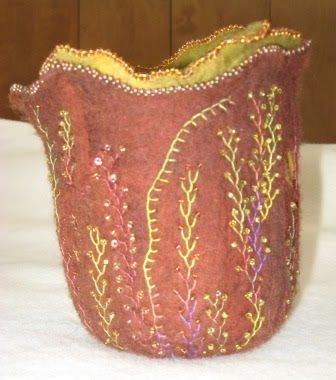 I used a couple different colours of hand dyed thread. I used four different seed beads. Lime, copper, and brown in two sizes. That is very interesting and explained very well, I have some more roving that I bought after the class I went to with your Mom but haven't had time to try again. I need to get back at it before I forget how :). This is GORGEOUS and I'm sure many will be putting tickets in for the chance to win this LOVELY vessel. GREAT JOB Cathy!!! We vary with numerous individuals the following; I ran across this website submit I couldn’t give up until My spouse and i done, even though it wasn’t just what I had been searching for, had been a good read although. Let me quickly buy your blog site feed in which to stay touch associated with a updates. I am planning to make a hollowed tree trunk to house woodland (felt) animals for our craft group project this coming Wednesday. Thank you for your tutorial. It has been helpful. Blessings and Best to you!